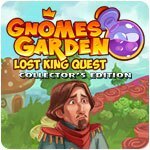 Gnomes Garden - Lost King Collector's Edition - Download and Play Free Version! The princess of our fairytale kingdom grew up and got married long ago. But one day, her beloved husband went hunting and didn't come back. He disappeared with his whole retinue. Where did he go? Go on an adventure through a world of secrets and mystical creatures in this exciting casual fantasy strategy game, Gnomes Garden: The Lost King. Settlers in trouble? Farm stopped bearing fruit? Puppies asking for too much food? Tribes suffering from a troll invasion? 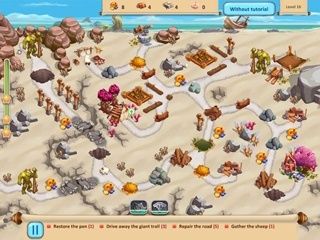 Play Caesar and use careful resource management and an unusual approach to help everyone! A bunch of quests, over 40 levels in four unique worlds - all this awaits you right now. 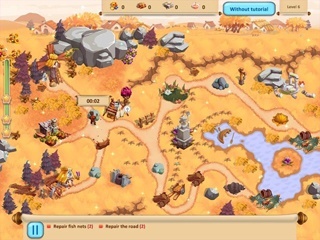 Restore ancient buildings, collect magical harvests, carefully distribute resources. All this is the key to success. Simple controls and a helpful tutorial will allow you to easily grasp the game's basics. If you get in a tough spot, don't forget about the princess's mighty magic! Gnomes Garden: The Lost King - find the king and return prosperity!